Actually, it is the individual subject area experts that tend to standardize rather than the Open Data authorities at any given organization. Geographic information, has long had standards whereby data are published as Web Services (see http://www.opengeospatial.org/standards) that can be consumed easily in mashups, and it is no coincidence that a large proportion of the sucessful uses of data from multiple sources includes geographic data. I think you overestimate the importance of business. 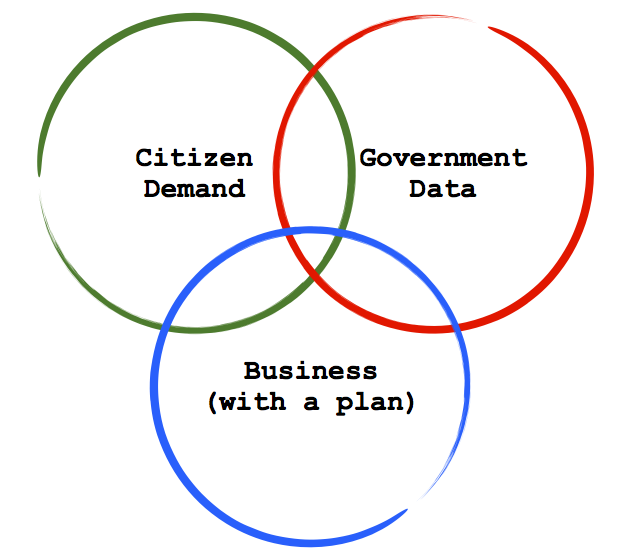 Citizens can make a great deal of use of data without needing a business plan. It doesn’t take a lot of money to process data into something useful, just a couple skills and a little time. The majority of the people who have made use of TTC transit data hasn’t been in it for the money. There has been a trip planner made, Steve Munro analyzed vehicle location data to identify the causes of irregular service and I made an improved next vehicle arrival site, all without a business plan. 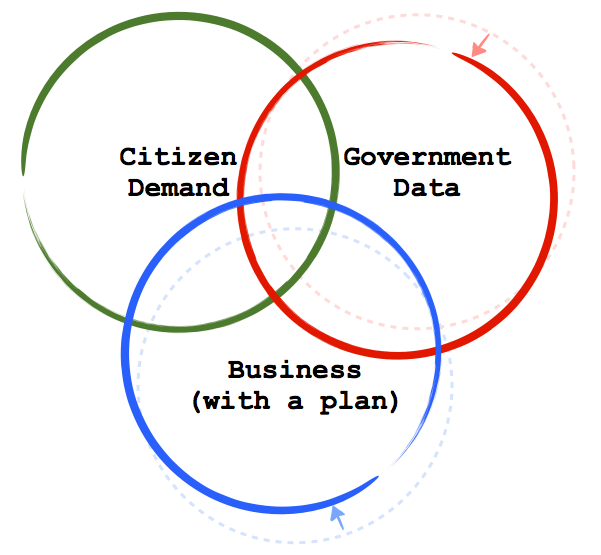 I agree that it isn’t required to have a common standard to use open data (this isn’t my point) – there is lots of innovation taking place on data sets in local communities – but if you do have some common standards it vastly increases the number of people who can utilize a data set, or contribute to a project that makes use of it. Again, I’m not saying the developers aren’t going to hack on data whose structure isn’t standardized across cities, or that their products don’t have value. They do. But if we want to create the standard data structures (and I think we do, so that more of that great work can benefit a bigger audience – especially in smaller communities with fewer developers) then I think the role of businesses (or organization that can scale to create value out of the data across jurisdictions), will be instrumental. I think Dave’s emphasis on the integration of business models is in fact key to the creation of sustainable, scalable open-data structure. It is true that many transit apps have been created without explicit business models in mind, but many of them suffered needless setbacks and red tape at the start because their pioneering initiatives weren’t recognized by data owners/creators as legitimate businesses with quantifiable stakes or benefits for the community/economy. Business models help make those stakes and benefits explicit and visible, which then (hopefully) gives data owners incentives and vision for why they need to keep upgrading, standardizing and publishing their data. Only considering benefits created by business is a serious flaw that perminates society. I agree absolutely — that said, it remains true. Last, I think your emphasis on highlighting frequent-use data is an important insight, Dave. Will be keeping this in mind and follow up soon. Speaking of that, how has the data-integration process been for ReCollect so far? I never got around to talking to you about that. Did you get the June data you needed in time? Was the snag about getting the data ahead of time ever fixed? David, kudos once again. Check out the efforts of CASRAI.org and ORCID.org for research data. This standardization is starting in earnest in kuali-style governance and sustainability models. Very early days, but very promising. I think there is a place for environmental data in this framework. For instance, the Air Quality Health Index (AQHI) is an open data set from Environment Canada that could be deployed via a location aware mobile application to deliver personalized health notifications. For example, if someone with asthma was concerned about AQ, they could set their ‘tolerance’ in this mobile app and receive personalized messages based on the AQHI (current or forecast) for their location. The AQHI could also be incorporated with localized crowdsourced health indicators. If someone I follow in this application were to post AQ concerns for a specific location, I could receive these posts. If there were enough take up of the application these two data streams (‘official’ AQHI and volunteered) could even be combined. The best model in Canada on the topic of standards is the Canadian Geospatial Data Infrastructure (CGDI) delivered by the GeoConnections program (http://www.geoconnections.org/en/index.html). They created multidisciplinary advisory nodes in 2000 or so, such as Standards, Portal, Access, policy, Marine, Technology Advisory Panel, Framework Data, Atlas of Canada, Environment, etc. (see their resource library – http://www.geoconnections.org/en/resourcelibrary, http://www.geoconnections.org/en/resourcelibrary/keyStudiesReports and for developers http://www.geoconnections.org/en/communities/developers/index.html) Members were sometimes at multiple tables to ensure the knowledge and ideas rotated between them all. Members were from all fed departments dealing with geo, private sector (e.g. ogc) , libraries, provinces and territories. They devised an open architecture, supported innovative programs like GeoGratis and Geobase, evolved, developed open standards and now support the creation of initiatives that built according to CGDI specs and standards. So now we see public health, environment etc. applications that are based on these standards. The archival community has come up with OAIS (http://en.wikipedia.org/wiki/Open_Archival_Information_System) and Library Archives Canada has come up with some preservation file format standards (http://www.collectionscanada.gc.ca/digital-initiatives/012018-2200-e.html). Also, librarians have developed some of the best catalogs see (http://liswire.com/content/second-phase-natural-resources-canada-libraries-now-live-evergreen) and ODESI (http://search1.odesi.ca/) and have adopted standards such as (http://spotdocs.scholarsportal.info/display/odesi/links). It would be good to collaborate with these well established communities before re-inventing any wheels. Librarians especially since they were one of the first to advocate for open data (http://www.statcan.gc.ca/dli-ild/dli-idd-eng.htm). Research libraries in particular are developing trusted digital data repositories and have well developed data sharing protocols between institutions and faculty that are also worth looking into. 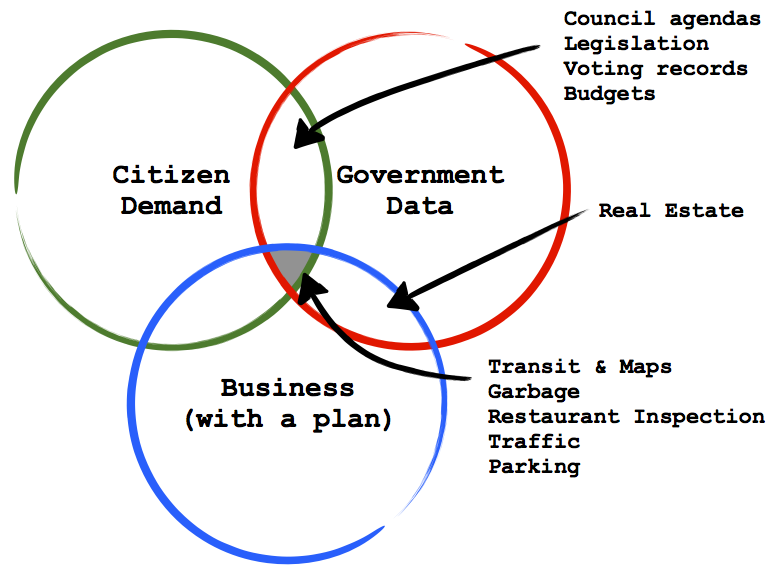 It would be great to see what exists and works in other data communities as opposed to just the open data cities. Cities would do well to look at existing systems, especially since many of these are open source and work well with large sets of data. Question. What role, if any should an organization like the Canadian Standards Council play in all of this? @ThomKearney, the Canadian Standards Council is still worrying over how to best insert DRM into the PDF files of the specifications that they BUY into. If the CSC is going to be involved in open data, it needs to first get a business model, one where the public can actually get the specifications. David, if by real-estate data you mean things like land-transfers and ownership and lot sizes, then I can see a definite use, and even a business plan. I’d like to know how various changes I might make to my house will affect my property taxes. In Ontario we have this economic abomination called market-value assessment, which has nothing to do with market, value or assessment. A black chamber organization (MPAC) does this process based upon data that is often hard to get. If the public had the ability to reproduce *OR NOT* the assessment, I think it would lead to much better land utilization. I agree with Michael. Real estate data would be extremely valuable to the people I have talked to about it. Combined with things like land use rezoning applications, building permits, property taxes and crime rates one could create very interesting apps about the single largest investment that many of us make in our lifetimes. I think the fact that people are not paying attention to that now is a symptom of the difficulty of gaining access to this sort of data today.